I do not believe it is possible for one human being to change another. Someone can possibly help someone change. But it is only the individual himself who can change himself, if he desires. That is why it pains me to see the current state of Boba Fett. Not too long ago, he was considered one of the coolest and most likable bit players from "Star Wars." But now he is simply a drunken former bounty hunter who is calling himself "Boba Phat." 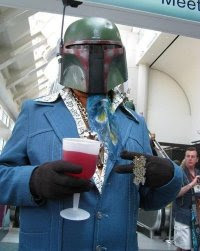 For the past two years, Boba Fett, or Boba Phat, has been showing up at comic book conventions with alcoholic beverages in his hands, hitting rudely on girls and disrespecting other bounty hunters. Friends have suggested rehab for him, and I hope he sees that they are right and checks himself before he wrecks himself.